Accuweigh supplied large platform scales for weighing heavy steel coils at BlueScope Steel’s Wingfield plant in South Australia. Supplied by Accuweigh’s Port Adelaide branch, the large platform scales replaced an aging set of mechanical scales that were no longer economical to maintain at the plant. The Australian made large platform scales were custom manufactured for mounting over the pit of the previous in-ground scale, eliminating the extra costs associated with removing the faulty scales and filling the pit with concrete to provide a firm base for the new larger platform scales measuring 1.8m x 1.8m. With a weighing capacity of 16t using 4 x 5t heavy duty load cells, these large platform scales will easily cope with weighing steel coils averaging around 14-15t each. 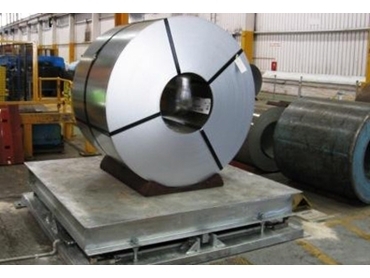 Though a higher safety margin would be required on this type of scale, using an overhead crane to lower and raise the steel coils should eliminate potential shock loadings. Accuweigh specialises in the supply of large platform scales to suit all heavy duty platform weighing applications with experienced service teams based in all mainland states providing superior product support on the entire range of scales and weighing equipment.